I didn't think that, at the time of the A&P bankruptcy, there were very many tiny classic locations out there. 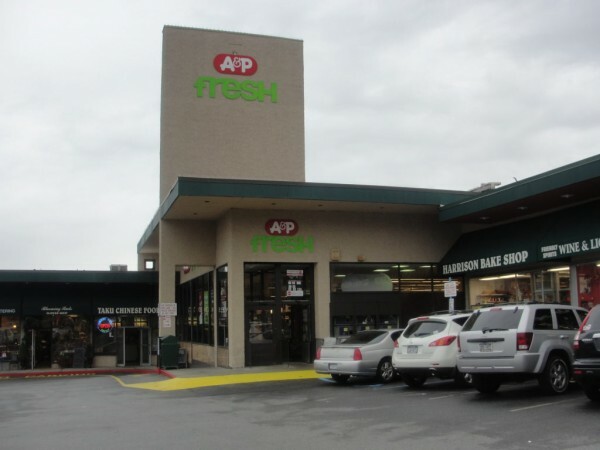 Well, I was wrong, apparently: the A&P Fresh in Harrison, NY is both tiny and old! Of course, it did have the Version 3 Fresh decor package (that's a picture of Holmdel, NJ from Acme Style), so it wasn't exactly neglected by corporate. It was previously a Food Emporium but was later converted to A&P Fresh. As of my visit, the interior renovation had been completed, but there was still no sign on the exterior, only a small banner with the new logo of The Harrison Market, an independent Key Food affiliate. 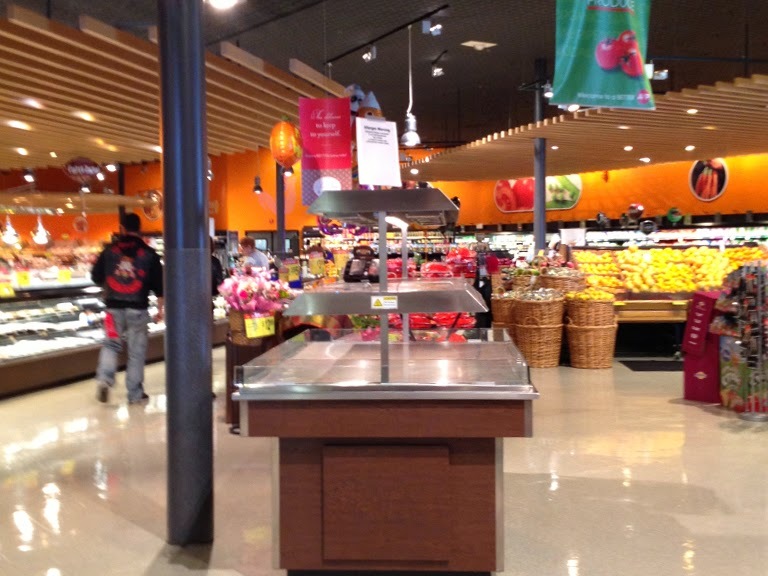 The store was originally planned to be a Key Food Marketplace. Produce lines the first aisle with meat along the back wall and deli/bakery in the front corner. Great use of space here! The baskets are a nice touch. Closeup of the new Harrison Market sign. I really like the new graphics on the walls here, but the ceiling, floor, and fixtures could really use an update. Pretty standard grocery aisles with a slightly upscale slant. And yes...as of my visit this past February, there were still America's Choice products on the shelves. Why are they Key Food (new) products $0.20 cheaper than the AC (old) products? Looking towards the back of the store. 1. Bad pun. OK, they get away with that. 2. Missing the "r" already in brand-new decor. 3. Come on, can't you put those boxes and the random aluminum pan somewhere else? 4. Not sure if there ever was seafood here, but there sure isn't now. This store doesn't have a service seafood counter. The last aisle has dairy along the wall. We're looking towards the deli/bakery and the front wall of the store here. No in-store bakery, but plenty of prepared foods and a nice deli. Awful floor, though. The Harrison Market is by no means a bad store, just a little rough in some places. I'd be interested to return now or in a few months and see where it is -- better, worse, or the same.